In part 1 of this series, I shared what you need to do to get started creating an online course. 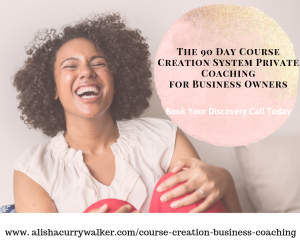 I talked about discovering what your ideal client is looking for in a course and how your expertise could be the answer that they are looking for. If you missed it, click here to read more. What will you teach, how will you teach it, and in what format? In this step, you now know what you want to teach, but you have to organize the information in a way that your clients can understand and feel like they are getting something out of it. One of the principles in The 7 Habits of Highly Effective People, a book by Steven Covey, is “Begin with the End in Mind”. This habit discusses having a goal in mind before beginning any task so that you know the goal that you are working to achieve. The same principle applies with a course. You must begin with the end in mind, begin with the overall goal that you want your clients to achieve in your course, not only so that you can talk about but so that your clients can see what they can achieve if they take your course. There are several ways to deliver a course. You can deliver the course live, pre-record it, use audio, video, or a written format or a hybrid of all of them. Delivering the course should highlight your strength. So if you feel most comfortable with audio only, create a course that allows you to do audio of your course. There are ways to integrate all of these methods of delivering your course that will highlight your strengths and allow you to shine. In creating a course, there are many tools that can be used for everything from designing your course to recording. Find the tools that not only help you create and deliver the course, but tools that will help you automate as much of the process as possible. I’ll spotlight a few of the tools that I use in upcoming posts. Setting the price for your course has more to do with your mindset about what you believe your knowledge is worth than it does about how much the client will pay for your course. There are courses that range from as little as $47 as high as $2,000 and beyond. The price of the course is contingent on your knowledge of the course, your level of expertise around the topic and how confident you are in the number that you place on the course. If you say the price of your course is $700, but you’re not confident in that and think no one is going to buy it, then guess what, no one will buy it. Find a price that fits what you have to offer and well as what you are comfortable with asking for. Having people purchase your course is contingent upon them feeling like you can deliver on what you’ve promised them. One of the best ways to to this is to share your expertise in various ways from a blog post to a social media post to a live video. 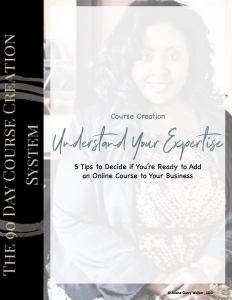 All of these formats allow you to share your expertise with your ideal client and allows them to see that you have the knowledge to deliver on the outcome that you’ve promised in your course. Launch your course to your ideal client with the sole goal in mind of helping them receive the benefit of what your course teaches. Make sure that whenever you talk about your course when marketing, you talk about the questions your ideal client has and how your course is a solution to their needs. Make your ideal clients feel that you understand them and can help them achieve the goal that they’ve been searching for. Target your ideal client through marketing and share with them that your course delivers the transformation they want confidently share your price for the course. 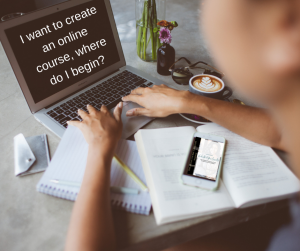 In upcoming posts, I will do an even deeper dive into the steps of creating and delivering a course, but part 1 and part 2 on this series shares the overall goals that you want to achieve to be able to get started creating your first online course.